While cables are designed at a small company in southern California,while instruments are shipped to friends at the British Antarctic Survey in England, while instrument locations are contemplated by a small group of scientists, technicians, and graduate students, I am also on a journey back in time to check up on the heart beat of the air we breath and the oceans we sail. The Arctic heartbeat to me is the annual change from the total darkness of polar night to total sunlight of polar day. This cycle, this heartbeat takes a year. There is 24 hours of day in summer the same way that there is 24 hours of night now. Let me first show, however, where we are heading before I look at the heartbeat. I love making maps and this is a rich and pretty one that shows North America from the top where Petermann Fjord and Glacier are (tiny blue box on left map). The colors are water depths and land elevations. 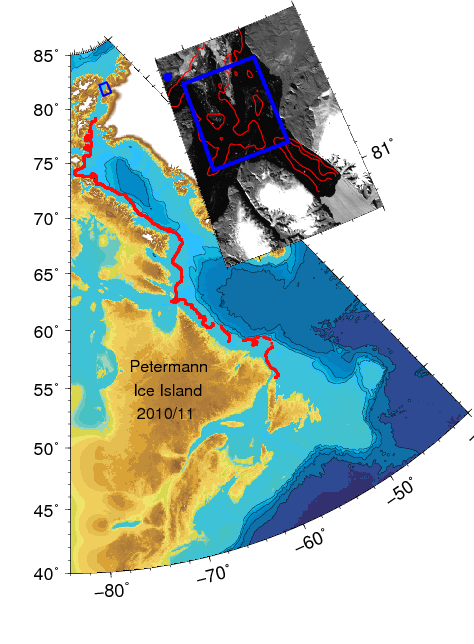 The thick dotted red line is where a very large iceberg from Petermann traveled within a year to reach Newfoundland. Teresa, one of the contributors to my crowd-funding project, sailed up there to Newfoundland to see this iceberg. And she made a movie out this voyage. So, what happens up there in northern Greenland only takes a year, maybe two, to reach our more balmy shores. What happens in Greenland does NOT stay in Greenland. Vegas, Nevada this is not. 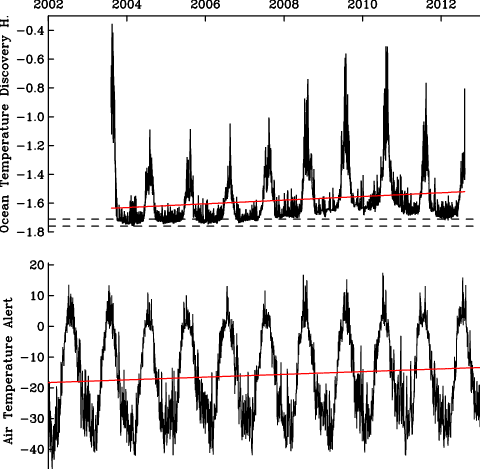 Top graph is ocean temperature, bottom panel is air temperature nearby. And as you go from left to right, we move forward in time starting in 2002 until the end of 2012 when the last ocean measurements were made. The red lines are a linear trend that represents local (as opposed to global) warming. Both go up which means it gets warmer, but careful, the bottom one for air is no different from a straight line with zero slope meaning no warming. It does go up, you say correctly, but if I do formal statistics, this slope is no different from zero just due to chance. The top curve for the ocean, however, is very different. It does not look different, but the same statistics tell me that the warming is NOT due to chance alone. 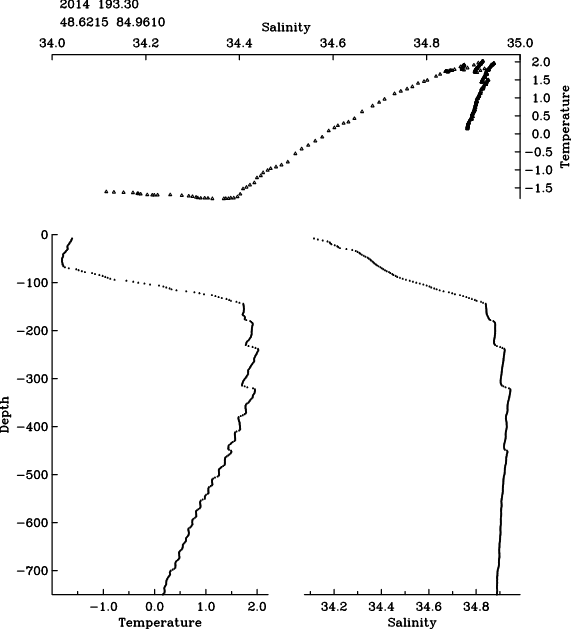 Oh, in case you wondered, the two dashed lines in the top panel are the temperatures at which seawater freezes and forms ice for the salinity range we see and expect at this embayment. As you add salt to water, it freezes at a lower temperature. This is why we put salt on our roads in winter, it makes the water freeze less fast. 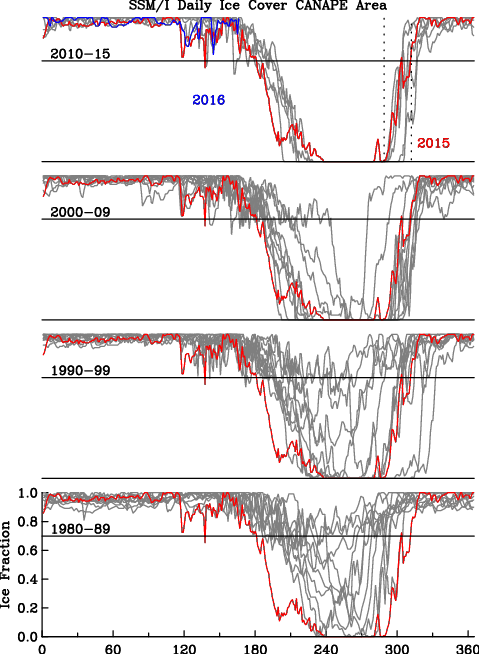 I am a doctor, so here is my conclusion: Ocean heart beat is a little irregular and the trend is not good news for the ice. Air heart beat looks normal, the trends may need watching, but I am not too worried about that just yet. Watch the oceans … that’s where the heat and the action is these days. Partial credit to Nick Clark who included it a rich and wonderful Al Jazeera essay entitled Global doom and gloom? Here’s some sunshine. Three people died in Buffalo, New York yesterday shoveling snow that arrived from the Arctic north. The snow was caused by a southward swing of air from the polar vortex that is all wobbly with large meanders extending far south over eastern North-America where I live. 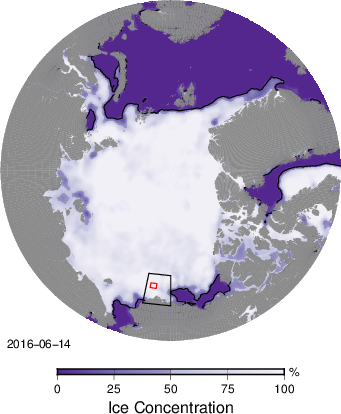 Physics deep below the thinly ice-covered Arctic Ocean hold a key on why we experience the Arctic cold from 2000 km north and not the Atlantic warmth from 100 km east. The Arctic Ocean holds so much heat that it can melt all the ice within days. The heat arrives from the Atlantic Ocean that moves warm water along northern Norway and western Spitsbergen where the ocean is ice-free despite freezing air temperatures even during the months of total darkness during the polar night. 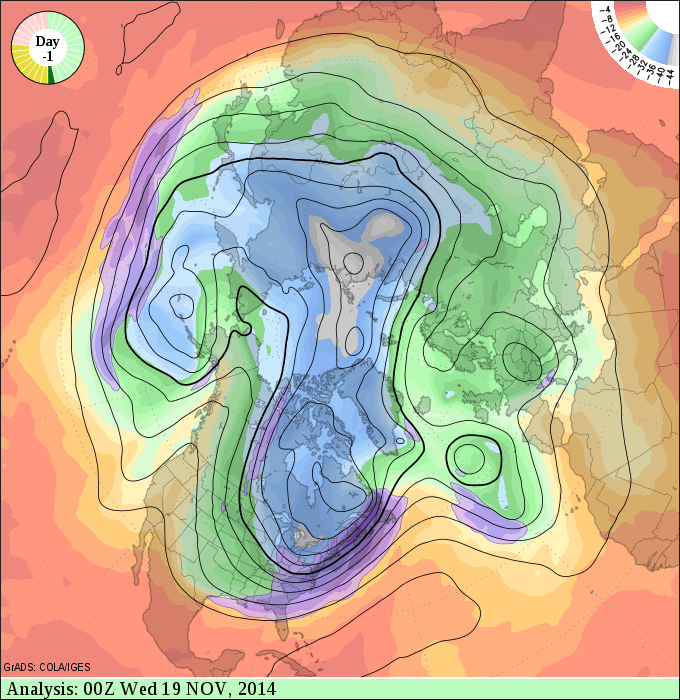 As this heat moves counter-clockwise around the Arctic Ocean to the north of Siberia and Alaska, it subducts, that is, it is covered by cold water that floats above the warm Atlantic water. But wait a minute, how can this be? We all learn in school that warm air rises because it is less dense. We all know that oil floats on water, because it is less dense. 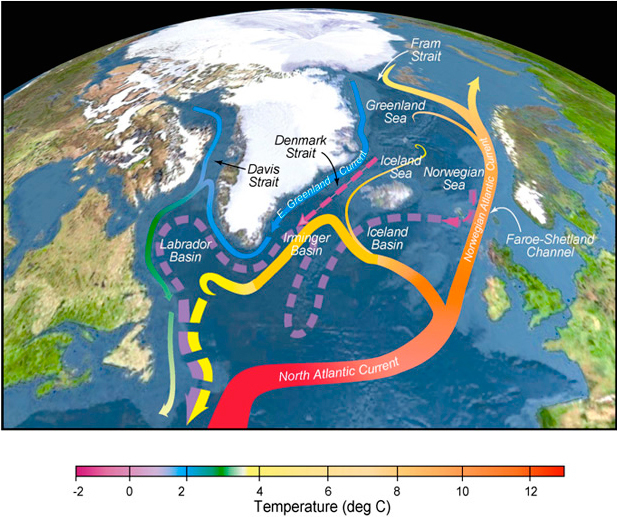 Well, the warm Atlantic water is also salty, very salty, while the colder waters that cover it up are fresher, because many larger Siberian rivers enter the Arctic Ocean, ice melted the previous summer, and fresher Pacific waters enter also via Bering Strait. So, the saltier and more dense Atlantic water sinks below the surface and a colder fresher layer of water above it acts as a insolation blanket that limits the amount of ocean heat in contact with the ice above. Without this blanket, there would be no ice in the Arctic Ocean and the climate everywhere on earth would change because the ocean circulation would change also in an ice-free Arctic Ocean, but this is unlikely to happen anytime soon. 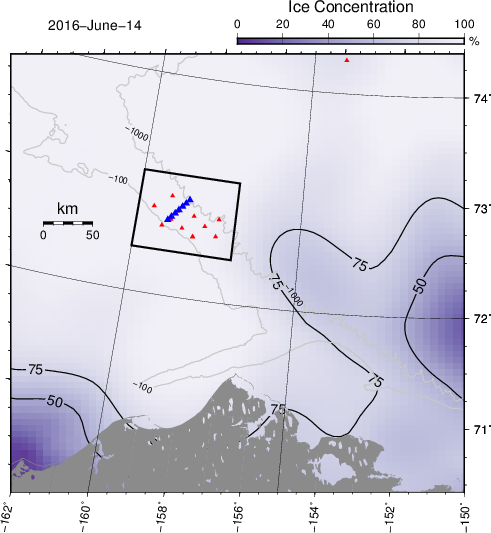 A single profile of temperature and salinity from an ice-tethered profile (ITP-74) off Siberia in July 2014. Note the warm Atlantic water below 150 meter depth. 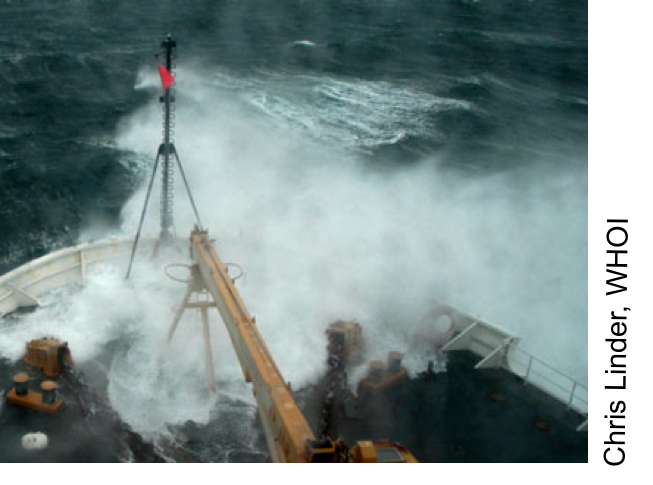 Some wonderful and new science and engineering gives us a new instant perspective on how temperature and salinity change over the top 700 meters of the Arctic Ocean every 6 hours. Scientists and engineers at the Woods Hole Oceanographic Institution with much support from American tax-payers keep up many buoys that float with the ice, measure the oceans below, and send data back via satellites overhead to be posted for all to see on the internet. Over the last 10 years these buoys provide in stunning detail how the Arctic Ocean has changed at some locations and has been the same at other locations. I used these data in an experimental class for both undergraduate and graduate students to supplement often dry lecture material with more lively and noisy workshops where both I and the students learn in new ways as the data are new … every day.